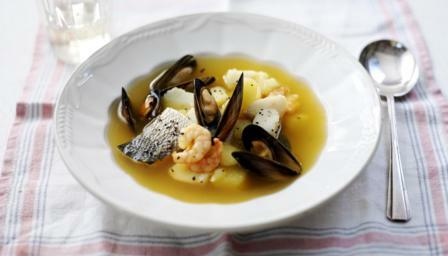 Fish soup made with fresh stock has bags of flavour and economically uses up all the fish. Make it as simple or luxurious as you wish. To make the stock, roughly chop the fish trimmings into three parts. Heat a large, heavy-based saucepan over a medium heat, and add the olive oil. Add the shallot, fennel, tomatoes, garlic, thyme, bay leaves, saffron and star anise. Fry gently over a medium heat for a few minutes, stirring regularly, until the vegetables have softened. Place a sieve in a colander placed over a large saucepan. Ladle the stock into the sieve, then gently pour in any remaining liquid from the pan - taking care not to tip the fish or vegetables into the sieve. Season to taste with salt and freshly ground black pepper. Cut the fish fillets into 5cm/2in pieces. Discard any mussels that are open or that don't close when tapped, or have broken shells.